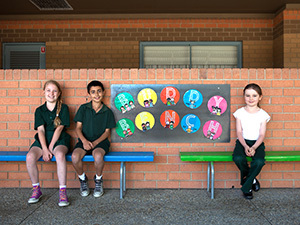 Charles Conder Primary School is an inclusive school catering for a wide range of students. Conder’s philosophy is to provide each student with the opportunity to succeed in learning and to reach their own individual potential. Our special needs learning support class provides the opportunity for children with learning difficulties to grow and function independently within the class, school and community settings. These classes provide an enriching program which is built on equality, opportunity, acceptance, tolerance and inclusivity. There is a strong emphasis on confidence, self-esteem, social and life skills, self-worth and belonging. Each special education student is catered for through an Individual Learning Plan which aims to target the students' academic, social, emotional and physical needs. These targets are assessed regularly and revised to meet the student's growth and development. Each student within the classroom setting is given the opportunity through varied teaching approaches, styles and programs to reach their goals, being academic or behavioural whilst engaging in a classroom setting. Our special education teacher is Anne Crawford, who works in our Learning Support Centre (LSC). The classroom teachers are assisted by Learning Support Assistants (LSAs) who work alongside the teacher to support students with curriculum related tasks. The support is either on a one on one basis with a specific student or in small groups. Our Student support team meets regularly to provide support and strategic direction on student resources to ensure all children are achieving the ILP.